Owner Since 1977, I Started This Business In A Van Going To Peoples Houses Doing Mechanical Repairs. All My Customers Always Asked Me To Look Over Their Vehicles Before Purchasing. I Started Locating Vehicles For My Customers And Decided To Start A Car Dealership That Offered Quality Vehicles & Unique Custom Autos. I Expanded The Business In 1992 & Feel Each Customer Should Get A Good Measure For Their Money! I Am Experienced In The Auto Industry & Business Management. I Am The Assigned Title Clerk For MD MVA, F&I Manager, & Notary In MD. I Also Take Care Of Accounts Receivable & Payable. I Enjoy Meeting Every Customer & Sincerely Appreciate The Opportunity To Serve Them! I Like High-Line Vehicles & I Have Collected A Few Of My Own! As The Daughter Of Barth & Donna, I Am Thankful To Be Able To Turn My Passion Into My Career. I Am A Life-Long “Automotive Enthusiast” Who Loves Every Aspect Of The Automotive Industry. I Graduated With My Degree In Business And Look Forward To Advancing My Education With A Specialty In Business Management. From Retail To Detail, I Enjoy Sharing My Automotive Knowledge With Our Customers. I Maintain Our Website And Oversee Daily Business Operations. 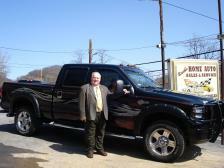 I Am Also Our Auto Locator Service Specialist & Personally Select Our Inventory. You Will Find I Always Greet Everyone With A Smile…Stop By Today & Let’s Talk!